‘jrww86’ was up against ‘netspider_by’ from Belarus and Russian ‘REVELKOF’, who both finished with $100,000 in runner-up prize money. ‘netspider_by’ was the first to find themselves short stacked and was the first to go when their Kd 6c lost out to ‘REVELKOF’s 6s Qc, which hit a club flush to take the chip lead. Over the next 14 hands, ‘jrww86’ chipped away at the Russian’s stack to eke out a lead. 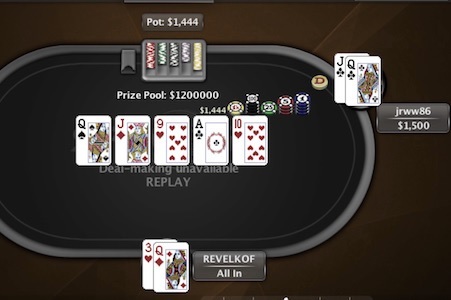 The final hand came at the 30/60 level when ‘REVELKOF’ went all-in with top pair on a Qs Jd 9h flop holding Qd 3h only to find that ‘jrww86’ had flopped two pair with Qc Jc. The hand held up and won ‘jrww86’ the $1,000,000 first prize. This year, three players have won one million-dollar Spin & Go tournaments. In February, ‘Rainman731’ was the fastest-ever Million Dollar Spin & Go winner, claiming the jackpot in just two minutes, followed in March by ‘guiemie01’ from Brazil. Overall, PokerStars Spin & Go tournaments have created 16 millionaires, including one rich week in October 2015, when six millionaires were made in just seven days. Spin & Go tournaments are fast-paced, 3-Max Hyper Turbo tournaments that start with 500 chip stacks. Each tournament has a randomly drawn prize pool that awards between two and 10,000 times your buy-in. PokerStars offer Spin & Go tournaments at seven different buy-in levels: $0.25, $1, $3, $7, $15, $30, $60 and $100.